Sweet Magnolias tapestry shows a glorious work of magnolias in a vase. The white petals of the magnolias are reflecting gorgeous colors of blues, yellow and pinks, among the green foliage. Magnolias are named after the French botanist Pierre Magnol. These colors are echoed in the fantasy like background to the scene. A decorative brown and golden border completes the work. 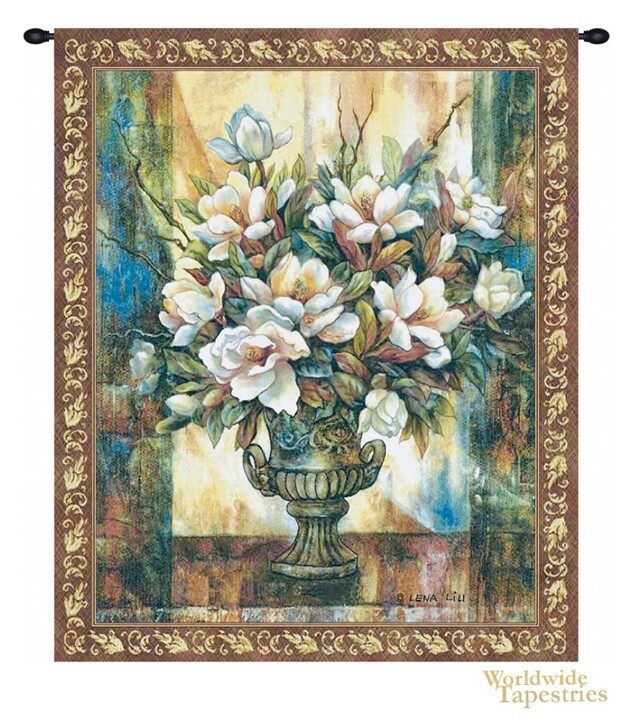 Sweet Magnolias tapestry is backed with lining and tunnel for easy hanging. Note: tapestry rod and tassels, where pictured, are purchased separately.